Recently, I have been going through about thirty years’ worth of newspaper and magazine clippings on gardens and gardening. An odd habit, you may think, in this day of Google Search, but I’m addicted to my clippings. There’s all sorts, from features on exceptional gardens worldwide, to book reviews, to monthly “top tips”. No-till, composting and caring for fruit trees are in the archive too, along with summer bulbs and some glorious articles on my all-time favourite: the walled kitchen garden. But in my own garden, I’ve just come up against a wall of an entirely different sort, one that I thought I had avoided: To my dismay, I have found you have to be very careful how you source seeds in Egypt. It’s by no means as straightforward as I had thought. For some crops, especially herbs, I buy seeds from an “A’ataar” shop selling seeds and scents for the house and garden. Parsley, coriander, dill and rocket are sourced from our local “A’ataar”, and as they are easily obtained and cheap to buy I am confident they are locally sourced. In other cases, we produce our own seeds and/or clumps that can be divided up for distribution around the garden. Chives fit this bill. Local spinach and dill seed themselves; likewise flat-leaf parsley and coriander, though not in sufficient quantities. For the most part, however, I bring packets of seeds from Britain and sow them from the autumn onwards according to the calendar for cultivation in Egypt. Now, whether this is a sensible way to source seeds is a tricky issue, and I don’t think I have got it right. This came to mind as I read an article about a restaurateur-gardener in Oxford, England, filling a wheelbarrow – yes, a wheelbarrow! – with a bumper crop of French beans from her kitchen garden. I pondered our scanty row of fragile mangetout in raised bed 3: seeds purchased in London but produced in Italy, they have germinated into plants that have every appearance of struggling. As for harvesting, I certainly won’t need a wheelbarrow! Usually, I buy lots of seeds from Kew Gardens or from garden shops close to the station there. Oddly, although Kew is home of the UK’s Royal Botanic Society, most of the seeds on sale are mainstream commercial, and there’s limited attempt to promote the cultivation of heritage varieties. This seems like an opportunity lost. Here in Cairo, we don’t have garden centres, and plant nurseries tend not to sell seeds. Why I don’t know, except that Egyptians are not keen gardeners. We can, however, source seeds from agricultural suppliers. This brings me back to the wall. In previous years, I have sown courgette (zucchini) seeds produced by an Egyptian company and, as far as I know, locally sourced. This year, for the vast sum of over EGP100, the Engineer brought a can of seeds produced by US company Seminis Vegetable Seeds. Against my better judgment I gave the go-ahead to plant them. Then I researched the company. Wrong – wrong – wrong! Seminis was acquired some years ago by: Monsanto. I now regard the seedlings with a jaundice eye. 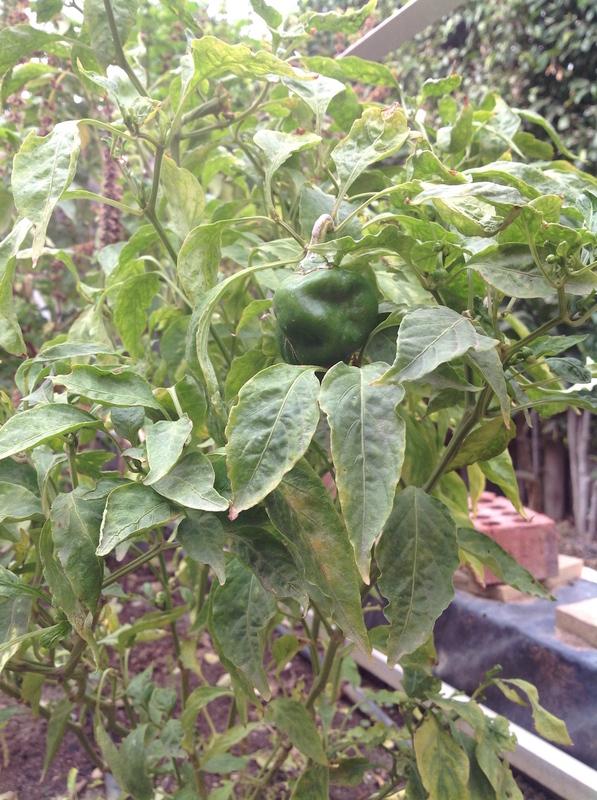 For one thing, they are hybrid – so no good for saving for future sowings. In addition, they are treated with Thiram; hence the leaflet wrapping the can that warns me in no end of languages to be careful how I handle them. According to Cornell University’s Extoxnet website, Thiram (Tetramethylthiuram disulphide) is a an anti-fungal agent, now used especially on soya beans, to prevent fungal diseases and as an animal repellent. For humans it is dangerous if inhaled, and potentially risky when used as a preservative on food crops. So what in the world are we, organic gardeners who have tried so hard to cultivate in tune with nature and with a view to observing best practice wherever possible, doing planting such seeds in our garden? And how could an agricultural engineer with experience working for one of Egypt’s leading food producers ( or so he claimed) have recommended that we use them? I am stunned. It shows that now, more than ever, I have to be extremely vigilant every step of the way. 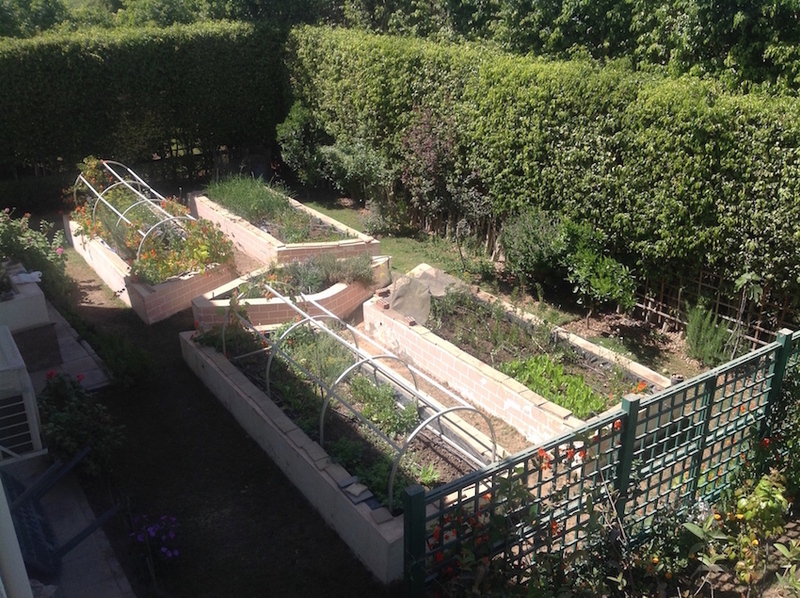 The kitchen garden consists of four large, rectangular raised beds, about 45cm high, and a smaller one in the centre which is dedicated to herbs. After a couple of seasons of failures with poor yields of veg such as courgettes, aubergines and green beans (although the leaf crops did well) I’m going to make this year one of experimentation and exploration. On my last visit to London, I managed to find a precious guide: The Maria Thun Biodynamic Calendar for 2016. Now, the phases of the moon and its constellations will set the rhythm for my gardening, while the observance of a mindful approach will bring back the energy of yoga, sorely missed last year. Egypt has its own Biodynamic Association: To judge from a map displayed in the manager’s office, there is a significant number of farms where this approach is applied, all along the Nile Valley from the Delta to Upper Egypt, and in an oasis in the western desert. But I am getting ahead of myself. In our case, what went wrong with the raised beds? Originally, they were filled with about 30cm of sand topped with 15cm of heavy black soil typical of Egypt’s farmland. As the soil lost fertility, there was not enough organic matter to replenish it. A disaster (or two!) with the irrigation system led to rampant overwatering. I suspect roots from the Indian laurels in the hedge also robbed the soil of nutrients. Finally, covering two of the beds with netting against the summer sun protected some plants but caused others to wilt, especially aubergines, while failing to stop tomatoes from succumbing to infestations of pests. The herbs carried on regardless, as if revelling in the spartan conditions. Bed 1: Prepared the soil with rough (i.e. not quite ready) compost and horse manure sourced from racehorse stables in Heliopolis. 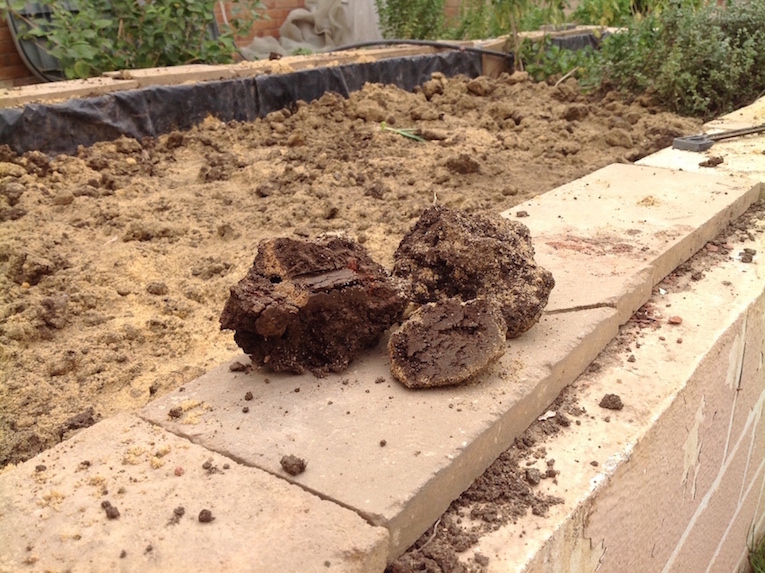 This turned out to be sawdust-heavy, which is a problem as it takes nitrogen from the soil in order to break down. 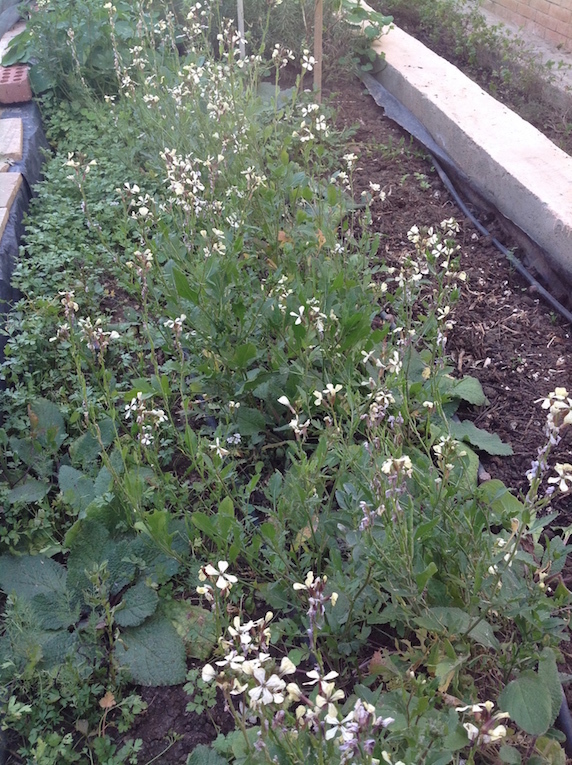 So the bed was left fallow for several weeks before sowing seeds. 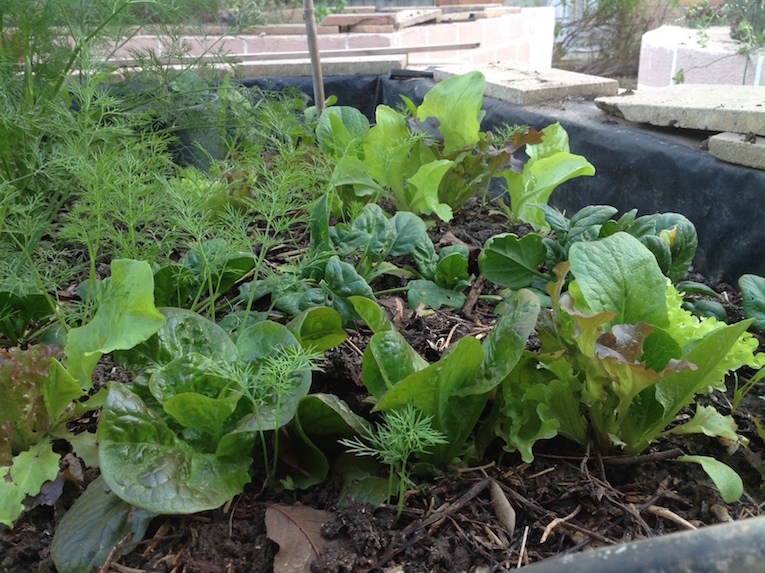 Mixed salad and chard are now doing well. 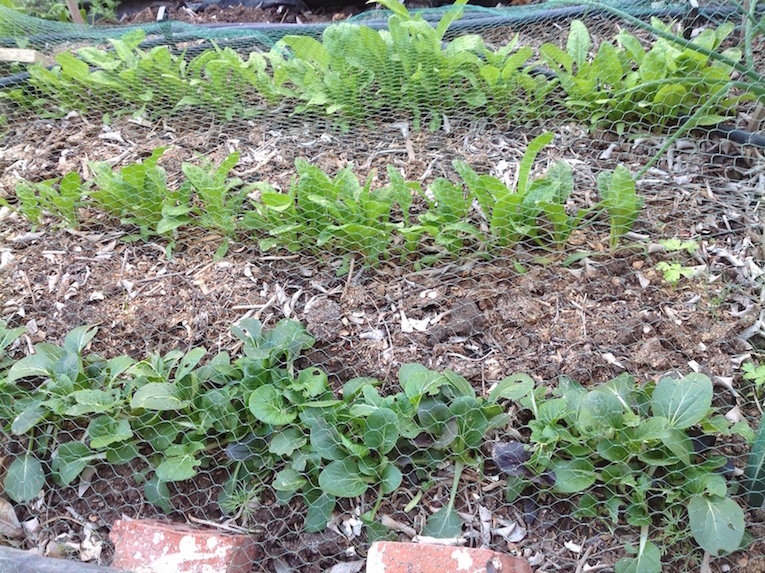 Spinach has also popped up unexpectedly, having seeded itself from last year’s plants. Bed 2: Compost was added to half the bed and seedlings of mixed lettuce and spinach (seeds from the UK) transplanted. Beetroot, shallots, chard and curly leaved parsley were sown directly into the bed, and all have germinated well – even the parsley! Dill and thyme arrived unplanned, self-seeded. Bed 3: Randomly planted by a local gardener without preparing the soil in any way, other than to whack it into submission while extracting some tree roots. Germination of rocket, flat leaf parsley and coriander was good but growth stunted, except for some of the rocket. Now in flower, the rocket is beloved by the bees. They go for the strong stuff! Bed 4: Poor watering and neglect had turned the earth into something approaching a great concrete slab, interspersed with chunks of rock-hard soil. Respect to the gardener who managed to turn it – but at what cost to the structure! There was no sign of any organic matter or life, although the bed was planted up in summer 2015. This is puzzling. Now, plans are afoot to work on beds 3 and 4, and to overhaul the herb bed. 20 bags of organic fertiliser of strictly vegetable origin (as the labels assure us) were delivered today; a professional garden assistant is on board; the Maria Thun calendar is here to guide me. Let’s roll up the sleeves and get stuck in! I have just been up on the roof of our house to check the moon. This is not as odd as you might think – maybe I should have been observing this beautiful feature of our night skies more carefully since I started the organic garden. For there is a crisis of epic proportions with the parsley. And the moon may hold the key. To say the parsley planted in a pot in the secret garden (the upstairs balcony, you may recall) is not thriving would be an understatement: it is completely stunted. Originally, I intended to sow early in pots and then transplant the seedlings into the raised beds following my usual procedure. That was the plan until I read an illuminating book, “The Gardener’s Folklore.”* Now I have to think again. Oh my goodness! It seems I have done enough harm by planting the seeds so early; to remove the seedlings to another site would be to invite disaster. So it is back to basics. There will be a new sowing of parsley seeds this week in the raised beds, and I will be pouring boiling water over them once sown in order to speed them on their way (otherwise, I read, they make a curiously roundabout journey to germination). The rows will be on a north-south axis, in harmony with the earth’s magnetic field – I’ve tried this before and noticed very good yields, although I hesitate to say the success of the crops was due to the orientation alone. This weekend is also an excellent time to sow other seeds, so it’s all systems go to get the pots and raised beds ready. But why now? According to my diary, the moon will be full on November 17th. A core principle of biodynamics, which follows the natural rhythm and cycles of the earth, moon and even zodiac signs, is that planting during the 48 hours preceding the full moon is generally – though not always – most beneficial. This is when its gravitational pull is at maximum, encouraging moisture to rise in the soil and seeds to germinate, and drawing the embryos onward into growth. Arguably I should also have regard to the zodiac. Leafy plants thrive if sown when the moon is in the water signs Pisces, Cancer and Scorpio. Root crops are best planted in the earth signs Taurus, Virgo and Capricorn; note that they may also benefit from being sown just after the full moon, in order to encourage downward growth of the tuber/root. Flowering plants, meanwhile, grow well if planted with the moon in the air sign Libra. The tricky part is that the moon is in each sign for only 2-3 days at a time. So how will I get this right? Doubtless what I need is an almanac. A mainstay of farming and gardening practice for centuries, almanacs are a mine of information including when and what to plant. But do I need an English or an American almanac, or one that is particular to Egypt? I suspect the answer is the latter. There are in existence historic almanacs for the country, dating from the C12 to C15, including one by Ibn Mammati from the Ayyubid era in the C12 that gave extraordinary detail not just about farming, but also about what to eat and how to live. For example, in the month of “Baramhat” (late February to late March) readers were advised to visit the “hammam” (public baths) regularly, and to avoid acidic foods, while farmers were instructed to plant food crops from aubergines to water-melons, as well as cotton, to take their fattened cattle to market, to prune late vines and plant new ones – and so on. This is all very well, but I think what is needed is something more modest and more up-to-date. It reminds me that many years ago, in Qatar, we knew an American Fulbright scholar, Dr. Daniel Varisco, who was researching Arabic almanacs as part of a study of the genre in the region. I seem to remember that cultivation of date palms featured strongly in the books. So please, Daniel, if you should happen to read this, would you get in touch and let me know: where do I find a modern almanac that will keep me in tune with Mother Earth as I sow the winter crops here in New Cairo? * “The Gardener’s Folklore”, by Margaret Baker, published by Sphere Books, London.